George Dunteman (1869-1932) and Bertha Wischsdadt Dunteman (1869-1951) at their wedding in 1893. George sat for the photo because Bertha was taller than he. William F. Dunteman (1876-1938) and Martha Henges Dunteman (1878-1971) at their wedding in 1901. 1897: Orchard Place post office and general store. 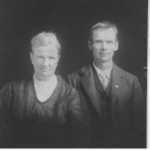 Frank W. and Martha Winkelmann Duntemann are by the lamp post. Harry G. and Elvin F. Duntemann are the smal boys in the horse cart. Herman Duntemann is the man to the right of the horse cart. Today, this location would be just north of Higgins Road and just east of Mannheim Road in what is now Des Plaines, Illnois. The site of the building is now under the Northwest Toll Road. Frank W. Duntemann and Martha Winkelmann Duntemann with their sons Harry G. and Elvin F. Duntemann. Date unknown but by the boys' ages probably 1898-1900. William Duntemann 1849-1921 and his wife Wilhelmina Nuernberg Duntemann 1859-1926. Date of photo is unknown, but probably 1900-1910. Elvin F. Duntemann (1895-1979) at his confirmation, probably 1911. Edwin Dunteman (1898-1981) at his confirmation, date unknown, probably 1914 or 1915.